Yvonne Chaka Chaka (third person from the right) flanked by NEPAD Agency and Princess of Africa Foundation staff. 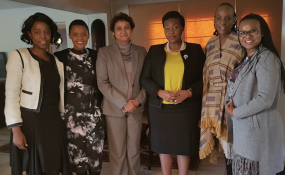 Johannesburg, South Africa, August 17, 2018 – The Princess of Africa,Yvonne Chaka Chaka, internationally-renowned singer and humanitarian has been appointed as the NEPAD Agency’s Goodwill Ambassador for TB and nutrition. Considered a role model throughout the African continent, Yvonne has demonstrated compassion for others throughout her career. She has promoted literacy, women and children’s rights, and is alsoa champion in the fight against malaria. As the implementing body of the African Union, the NEPAD Agency’s strategic impact areas areindustrialisation and wealth-creation; shared prosperity and transformed livelihoods; human capital development and transformed institutions; and environmental sustainability. Given Yvonne’s strong commitment to the values and principles of the NEPAD Agency, she will be an excellent and eloquent advocate of the continent’s development agenda.